Since we ate lunch super late, we wanted something small for dinner. 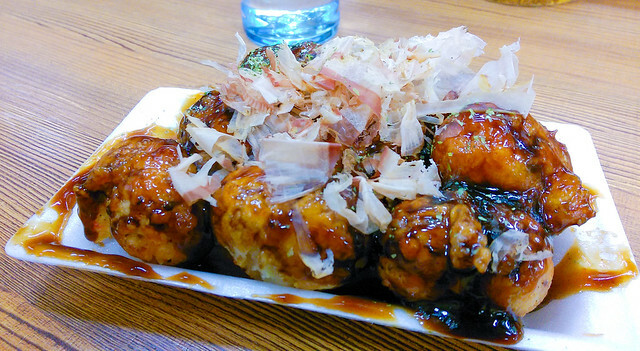 Several sites (like this one) reported that the best takoyaki in the Kansai region was in Kyoto, from Takotora. Takotora has has three locations in Kyoto, with two locations were a bit far from a train station. The one in Sakyo-ku was a 30 min train ride from Gion, plus another 10 min by foot. Tokyo has many trains that cover the entire city; Kyoto (and the rest of Kansai) has fewer lines, so we found ourselves walking further from train stations than in Tokyo. Takoyaki is a ball-shaped snack filled with a piece of octopus (tako) inside, that originated from the Kansai region. The entire menu was on the wall, and written in Japanese. Many customers around us ordered takoyaki or sliced octopus with beer. We got one order of takoyaki, 8 pieces for ¥600. This takoyaki was larger than the takoyaki found in Hong Kong and the Bay Area. It was also crispy on the outside, with a huge cut of octopus inside, and a generous heaping of bonito flakes and sauce! Here’s a video of the takoyaki, with the bonito flakes in action! 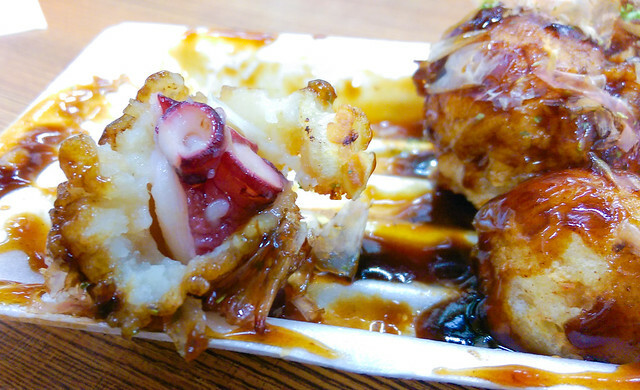 If you’re in Kyoto, don’t miss out on these delicious takoyaki! i had takoyaki in Tokyo and i was disappointed. First, there was no “real” tako (octopus)! it was kind of a mush (maybe w/ tako mixed in) and second, was kind of greasy. what i think i need to do is, travel to Kyoto and try it again there!! your pics look great and i am sure it tasted good, too!